This Saturday we'll be at the Pioneer Valley Zine Fest at the Flywheel in Easthampton, MA! We've been prepping a second mini comic collection of our Weird Healing work in The Montague Reporter. We will have that second volume, the first and a selection of smaller original art for sale there. Stop by and say hello! We'll be around from 10 to 3. This past Saturday we had the good fortune to screen our work at the Echo Park Film Center! It was a lovely turn out of people, who not only attentively sat through 40 minutes of animated shorts, but also enthusiastically participated in a brief drawing exercise pre-screening. Plus! 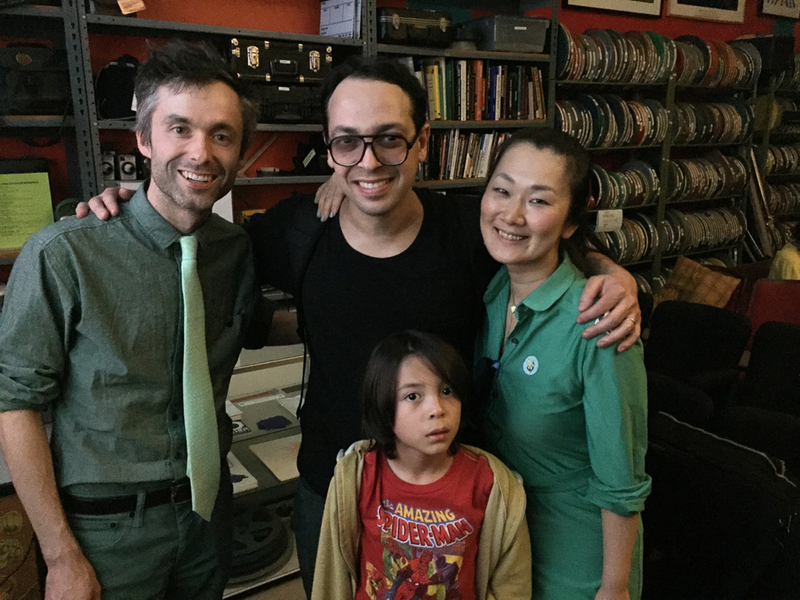 Alejandro Cohen (Pharaohs, Psychic Powers, dublab and more!) provided a special live scoring to Coast at the beginning of the screening. We will have the live scored version of the animation up in a little bit! All in all it was a great experience and we hope to do something similar again soon! This past weekend, in the midst of intense winds and piles of snow, we made our way to Snow Farm, the art/craft haven in Williamsburg, MA to run a two day animation workshop. It was a cozy success! A great mix of experience and styles, all of the students brought more enthusiasm and energy than we could have hoped for. The focus was on developing characters, animating short movement loops and walk cycles by hand, editing them on computers and then exporting them as GIFs. As always, with all opportunities for us to share, we are extremely grateful and would love to do more workshops and activities like this in the future. As always, we started off the first day with an Exquisite Corpse exercise to get everyone comfortable and in the right frame of mind. We also were once again able to take advantage of the massive light box in the studio. Do you like video games? Do like learning about video games or simply watching other people complete challenges? Our good friend lofty recently started a video game channel on Youtube and he commissioned us to design his main avatar (loosely in his image) and an intro animation for his videos. It was a fun opportunity and we came up with something we hope is appropriately poppy and video game-y! We are open and happy to do more work like this! 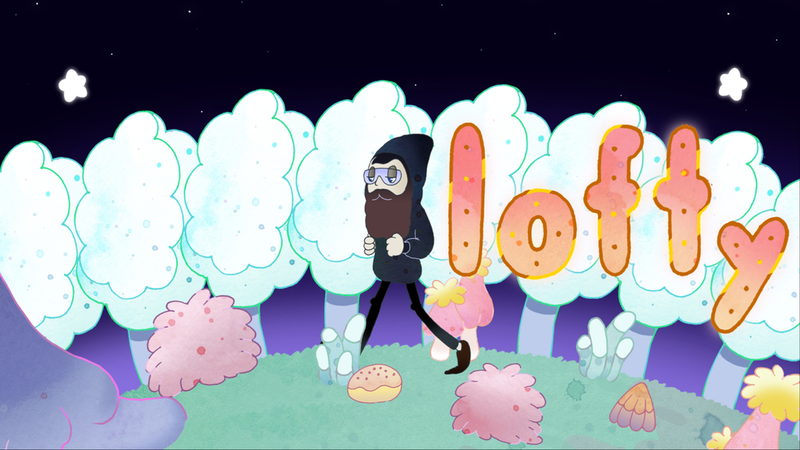 Please watch the goofy little intro and subscribe to lofty's channel! Oh, and the beautiful music is by lofty as well! Another meditative Kira Kira video! This time loosely following the twinkling visions of a lonely walker, along a quiet improvised piece by Kira Kira. Again it is a very sparse video to match the atmosphere and immediacy of the music, using only assets from our live visual performance at Iceland Airwaves last fall. At the bottom of the page is the last video we made for Kira Kira: the long spinning spire. Listen to this beautiful song by Kira Kira, Call it Mystery, and forget yourself in the gently twirling spire. The song features ESKMO on vocals and accompaniment by The Echo Society's 15 piece orchestra. The animation is a small asset taken from our live visual ensemble used during Kira Kira and ESKMO's performance at last year's Iceland Airwaves. Listen to it, watch it, and self-hypnotize yourself into the new year. Thank you for your everything in 2014! Here's to weird, wonderful things in 2015!!! 2014 was an interesting year for Overture! So many new things for us! We did a bit of live visuals, taught a small workshop, worked with live video, made our first zine and a bunch of other things! We've recapped some of the highlights below. If you missed any of these during the year, take a look! Weird Healing is a strange project that really dominated the year for us. What started out as a pitch for an animated series (still looking for takers!) became a short animation, a newspaper comic, a zine, a small performance and a mini exhibition. Below is the short, premiered at Animation Breakdown Roundup at Cinefamily in Los Angeles, CA with music by the great Halcyon Tone! The Weird Healing comic, which began in January of 2014, is still being published regularly in a local newspaper, The Montague Reporter. It started out as an outlet for the stories we developed for the series pitch but exceeded those and now we've gathered most of them into a zine. The zine is available on our site store and in a number of select shops. Weird Healing even had a small exhibition and event evening at FOE in Northampton, MA. The exhibition, which showcased Weird Healing-related artwork, focused on various adventures of the two friends. The event had a live-scoring of Bryum & Kapok by Yume, from Montreal, had a little story reading, some animation screening and the local premiere of the Weird Healing short. There was a good turnout and the day after we released the short to the public online. Coast is an animated music video we created for Japanese musician, Oh shu. In 2012, Oh shu performed a live scoring to Bryum & Kapok at our Ritual Exchange event with MAGI UNION. He kept us in mind and contacted us to create a video for his song, Thailand, to accompany his album, Wang. We wanted to create something with the ocean and tide pools and had a lot of footage from our trip out West earlier in the year. We were able to use the footage as background and gain a little more experience working with video and animation together! Kira Kira, our long time collaborator, asked us to create visuals for her and musician ESKMO's performance at this year's Iceland Airwaves. It was our first time creating many short animation assets and implementing them together real time with a live performance. Most of it was seat-of-the-pants improvising but it was a great deal of fun and we hope to do more of it again in the future! The pop-up book, The Hole, developed by Hideayaki Takahashi, with Overture artwork, made it out into the world this year! It was a long process and we learned many things along the way - and even still would love to do more! Our artwork for The Hole continued on to Taketa Art Culture, an art festival in the town of Taketa, Japan. We were invited to take over an entire gallery, where we screened our animation, showed some older work and displayed our artwork for The Hole on a larger scale, separated on panes of plexiglass to demonstrate the depth of the pop-up book. It was a wonderful opportunity! Art and craft paradise, Snow Farm, invited us to lead two, one day animation workshops this Summer (thanks to the kind suggestions of Steve Theberge!). It was all hand-drawn animation, digitally edited and rendered in Photoshop. It was also our first true animation teaching experience, but all the participating students quickly dug deep into their projects and made some exciting animations! Snow Farm even invited us back to run a two day animation workshop in February! Hopefully we will have enough people sign up! Please sign up! Another first was talking at our local community, Greenfield Community College! We discussed our development as Overture, the background behind some of our stories and screened a bunch of our animations. It was great, more people than we expected turned out and Dean of Humanities, Leo Hwang, who invited us to speak, was very accommodating! Our experiences and developments are quite different than the typical independent animator and it was very good sharing! We would like to do more of it! Please invite us to your school! Hanna Fushihara and Jennifer Armbrust invited us to participate in a very interesting group, Sheros, at Lamp Gallery in Tokyo this past Fall. All participating artists wrote a letter to a female hero and create a portrait of the woman. Visitors to the gallery were also encouraged to write and display a letter. We also did a bit of DJing this year on dublab.jp! Thanks to Saito-san and Hara-san, we played some of our favorite music and talked a bit about current projects at cafe Malmö in Tokyo this Summer. Take a listen! AND there was live scoring of our animations this year! Once at Sight + Sound II hosted at Flying Object in Hadley, MA with TCPPP playing live music to our Halfway animation (embedded below). Then again, with the Session Players live-scoring Coast at The Future in Brattleboro, VT. And again, at our Weird Healing mini exhibition/event with Yume playing to all three Bryum & Kapok pieces! It only makes us want to do more! Interested in making animation with us? We are doing a two day workshop on hand-drawn animation this coming February (2/14 & 15) at Snow Farm in Williamsburg, MA! We did two, single day guest workshops during the summer and were asked to come back for something a bit more in-depth! This workshop is for beginners and folks with experience. For anyone with an understanding of the process we will be sharing some of our techniques with watercolor and character development. If you, or anyone you knows might be interested, consider joining! The workshop has a pretty tight enrollment limit! Register here. The characters from the pop-up book we did the artwork for have had an unexpected development! During the holiday season they are part of an interactive display at Canal City (super shopping space) in Fukuoka! The displays, arranged by Plantica and programmed by yakul features flower and plants that, when touched, emit various sounds that accompany the music playing in the area. It is exciting to see them pop up in a new setting! Two weeks ago on 11/7/14 we had our first experience adding live visuals to a beautiful performance by Kira Kira & ESKMO, and backed by an amazing ensemble. The performance was held in the impressive Harpa Concert Hall as part of the 2014 Iceland Airwaves music festival in Reykjavik. As it was our first performance of this kind, adding layers of visuals timed to the music on the fly, we were pretty nervous. But it was a success! And we hope to do more of it! Perhaps we will have some video of the performance up at a later date. A little late in posting this here but! Weird Healing is screening in this year's Animated Dreams! This is our second time in the Estonian animation festival, the first being in 2011 with BLESS. Weird Healing will screen in the Panorama I program on 11/22 at 3:45 PM at Cinema Artis 2. Ticket details here! 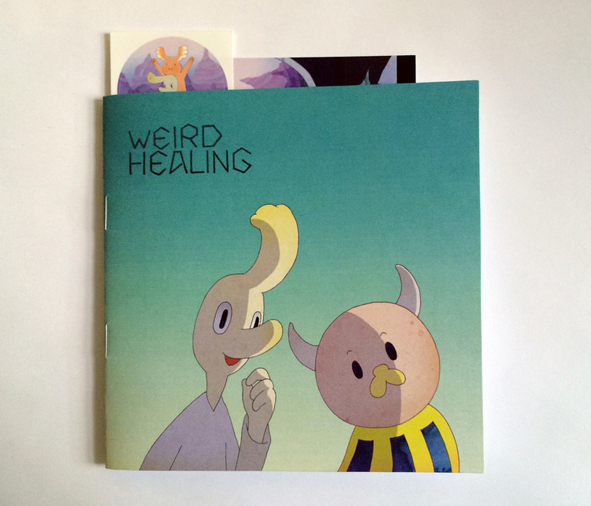 The Weird Healing Zine is now available for purchase on our site store! For 5$ you can get caught up on all the Weird Healing comics that have been published in The Montague Reporter! And if you still haven't watched the Weird Healing short animation you should do that as well! The zine also comes with a Weird Healing animation still postcard and a set of two Weird Healing stickers! There are some other items for sale on our site store, expect more in the near future! The zine is also available at the FOE Store & Gallery where we currently have a mini show going on. Pop over there if you are local to get a better look at the actual book! AND they happen to be available at Independent Theatre Liberté in Hita, Japan as well! Two locations so far! Our super short animation for Weird Healing, with sound and music by Halcyon Tone, is now public! Premiered at Animation Breakdown Roundup at Cinefamily this past Spring it has been waiting quietly to be shared with everyone. After screening it last night locally for a lovely group of people at our mini-show of the same name, we decided Weird Healing needed to go out into the world. So here it is! On a distant planet, Pim and Jiji visit a subterranean city after reports of a monster and people disappearing reaches them. Pim has a suspicion what the monster's ailments might be and decides to take a closer look. The Hole, an LED-embedded pop-up book concept album by Deep Frame, with artwork by Overture, is finally available for purchase! Below is a video showing some of the pages and workings of the music controlled LEDs, but if you follow this link you can purchase one of the few copies in existence and look and listen for yourself! During our trip to Japan in 2012, Hideaki Takahashi contacted us to work on this project. We met in Aya's hometown, Beppu, and between visits to many local hot springs, we discussed the story and the general visual elements of the book. In many ways, the book is a response to the massive earthquake of 2011 and the resulting disasters at the nuclear power plant in Fukushima. A young girl, friend of forest creatures, unearths an ancient and seductive power that is both empowering and impossible to fully control. We hope you get the opportunity to experience the book in person! Weird Healing at FOE in Northampton!!! Oct 16 from 7 to maybe 9! Come learn with Pim and Jiji! A local premiere of our short short short animation! Weird Healing illustrations on the wall!!! A set by Yume from Montreal, including a live scoring of an Overture animation! PLUS a Weird Healing zine for sale of all the comics (to date) that have appeared in The Montague Reporter! The mini show starts Oct. 10 and goes through the end of the month. Feel free to join/share/ignore the Facebook Event as well! This weekend marks the end of the Taketa Art Culture festival and so also the end of our show at KataMuku House. We highly recommend anyone in the area to visit the town and all of the amazing shows currently on display. Our show consists of three parts. On the first floor we have a screening room, showing a selection of our animations, and a room showing older work, namely our MoonHare series. The second floor is entirely devoted to our artwork for The Hole, the pop-up book concept album we spent the last two years working on. The pop-up book itself is on display, as is a selection of sketches and process images. And on the wall, or more precisely, hanging from the ceiling and aligned against the wall are all of the pages of the pop-up book. Each page was printed larger than the actual book, separated into the layers that actually physically pop up in the book, cut out and pasted to plexiglass which was the hung from the ceiling. Visitors can look down these large pages and feel the depth on a grander scale than in the book this way. It is a very exciting show for us! Our animation, Coast (music video for Oh shu's Thailand track) has been nominated for Best Music Video Award in Bradford Animation Festival, UK's longest running animation festival. The festival runs from November 17 - 22, keep an eye on the site for screening locations!